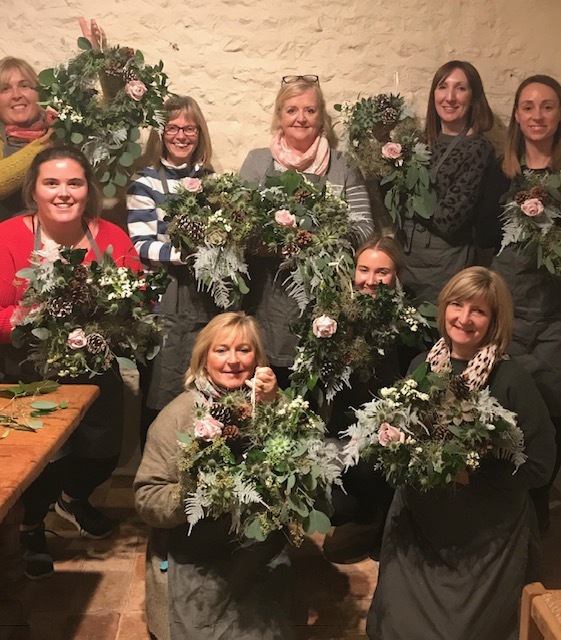 The school has been bustling for the last six weeks with our beginners course drawing to an end and the start of our Christmas wreath workshops. We had a very full studio on Saturday with three fully booked wreath workshops back to back running throughout the day. I want to say a big thank you to everyone that came and thank you for all your lovely comments, it means such a lot. I am so excited for our next Christmas creative day on Thursday and I am looking forward to sharing all our photos from the day on our Instagram and Facebook pages. 2019 will be an exciting year at the school. We are launching new courses including a “Celebration of Summer, Foam Free Masterclass’. There is an ongoing trend in the floristry industry to be more environmentally friendly. Philippa Craddock highlighted this when going foam free for the royal wedding. Sometimes the methods can be more time consuming but it is so important to be aware of our environment and I am thrilled to be teaching this class, as this is an area I am really passionate about. Students will be shown how to create a foam free table urn display and then they will be able to create their own, using a selection of beautiful British grown flowers. After a delicious lunch, Alicia will then demonstrate how to create a foam free table runner. Another short course that will be coming to the school in 2019 is our two day ‘Introduction to Floristry’. Over the course of the two days students will be given a talk about the basic principles in floristry, conditioning, composition, colour and texture. A demonstration will be given on how to create a hand-tied bouquet, table centre display and a wired headdress and then students will be able to make these arrangements for themselves. This is the perfect course for anyone who would like to dip their toe into the world of floristry and get inspired and creative. Our wonderful beginners career course is shortly coming to an end. These fantastic ladies have created so many displays over the last few weeks and covered a lot of theory too. Each one has become a fantastic florist and there will definitely be tears next week as the course concludes. We will shortly be releasing a video about the career courses that we offer so if you have ever wondered about doing a career in floristry, why not come along to our free open evening in March, where we talk about the courses, you will see our studio, see a demonstration and have a play with a few flowers. To book your place click here. But for now I must get back to wreath making, I simply love making wreaths! Thank you for reading our blog and I would like to wish you a very Merry Christmas from Flourish Sussex Flower School.